Latest News: After conducting the Delhi HC JJA mains examination on 24th Feb 2019, now Delhi High Court is going to hold the interview process. Qualified candidates need to carry their interview letter with them. They can download it from testhill.com. The Delhi High Court has issued the date of the Senior Personal Assistant Pre and Mains Examination. The examinations will be held on April 28, 2019. Admit cards will be available from April 22, 2019. Candidates should check Delhi HC Sr. PA Exam Date & Admit Card notice to know more about the timing & reporting time of examination. High Court Delhi has issued Admit Card for typing and shorthand test for the recruitment of Senior Personal Assistant post. All the candidates who have applied for Senior Personal Assistants of the Delhi High Court, they can download their Admit Card from the official website delhihighcourt.nic.in. Typing and shorthand test for senior PA recruitment 2019 is to be held on March 9, 2019. Short Info: Delhi High Court has successfully invited the students to fill up the vacant applications for Delhi High Court Junior Judicial Assistant seats from 4th January 2019 to 23rd January 2019. There are 60 vacancies in this recruitment. Candidates need to appear in the written examination to get this job. The examination is to be held on 24th February 2019. 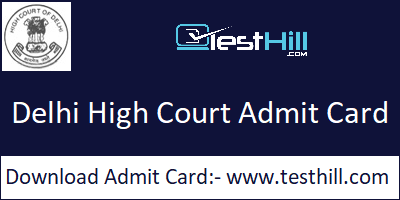 Candidates need to carry their Delhi High Court JJA Admit card 2019 to participate in this examination. The admit card is available on www.testhill.com to download. Applied candidates have to download it from the official website before the examination so that if they have any problem in the admit card they would be able to contact the officials. Delhi High Court is going to conduct the Delhi High Court Junior Judicial Assistant (Technical) Examination on 24th February 2019. Candidates who have applied for Delhi High Court JJA Recruitment 2018 they have to appear in this examination. To appear in the written examination, they need to have their admit card with them as an entrance key. You can download it from the official website or from this page. Without the admit card, they will not be able to enter the exam hall. Admit card contains some information regarding the exam and the candidates which are very useful for the candidate and the examiner.